In a nutshell, a Fog System (Atomizing Humidifier) is just high pressure RO water that is atomized through misting nozzles. Seems easy enough, right? While it’s true that these systems are relatively simple, an improper design can have major consequences. In this series, we share with you the most common design mistakes and how to avoid them. You might imagine it’s highly unlikely for someone to undersize a water treatment system but it happens more often than you might think. 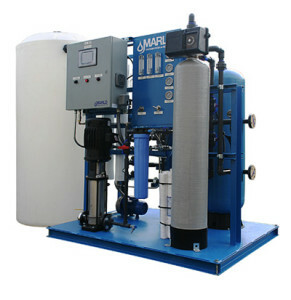 Reverse Osmosis works by pressurizing the source water and passing it through a semi-permeable membrane which removes 98-99% of the dissolved solids. Typically, for every gallon of feed water, about 65% is sent to the humidifier as permeate (RO quality water) and 35% is sent to the drain as concentrated mineral water. This will differ depending on a few variables such as the size of the system and the manufacturer so review the data sheets for your specific efficiency. Now that you know the manufacturer’s efficiency ratings, calculating the permeate output seems quite simple. But did you know that water temperature greatly effects the efficiency of an RO System? If you read the fine print on the data sheets, you’ll notice the water output is usually based on 100% efficiency at 77°F water temperature giving the 65/35 mentioned above. For a system that is being designed to supply a humidifier during the winter months, you’re more likely to see a feed water temperature of 50°F or less. For example, when using 50°F water you must apply a 0.68 temperature correction factor to the permeate (correction factor x permeate at 77°F = actual output). Also, keep in mind that the system efficiency begins to decrease the moment you start the system so this also needs to be accounted for. Copyright GoFog, Inc. 2019. All Rights Reserved.